A bird flew into the window here at work, I don't know when. It was very challenging to get a photo of the impression, because it is very faint. Plus I am working within the limitations of a point-and-shoot snapshot camera. I finally tricked the camera to stay in focus, then took a reference photo so that I could later reduce the intensity of the background and create contrast. However, the tree is moving in the wind and perfect subtraction is not possible. Some manipulations later, I had something I thought revealed enough detail that you could see it is a bird, though some of the detail is lost. 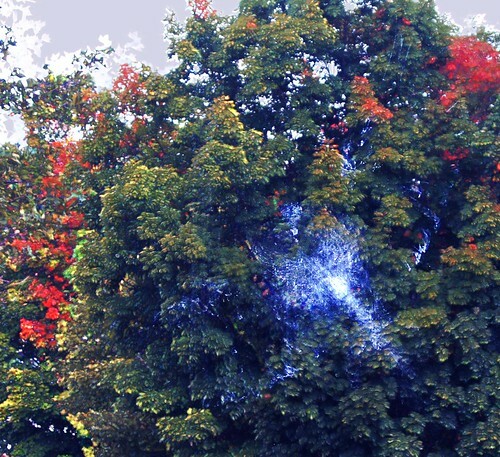 You can now see the ghostly image of the bird, including its wing tip in the upper right. For more detail, view the larger size on Flickr. I wonder what became of the bird. Very cool! I would love to learn photo editing tricks like that. Some years ago, I lived in a very windowy place, which would get one or two bird-smackings a year. Most often, the bird fell like a rock, seemingly dead, but was only stunned. A little while later, it would get up, stagger around, and eventually fly away. I never found a dead bird, but it's possible the local cats took care of those (and probably absconded with some of the stunned ones, for that matter). Looks like a mourning dove outline to me. Nice photo work btw! I've always wondered how people took pictures of poltergeists. But, in today's digital photo age, it's probably a lot easier than it used to be. Sure it was a bird? Maybe it was Jean Grey, aka Dark Phoenix! To me, it looks more like a ghostly lobster in the tree. It was a GHOST LOBSTER!!! I'm wondering if I can wait until sundown, somehow light the thing from an oblique angle and maybe get more detail. The problem is, it's on the outside of the glass, so it may not work. BTW - here is the un-enhanced photo, in case anyone is interested. what you can't rappel from the roof to light it from the outside? Geeze, where's your commitment. Ah. THAT looks like a ghost lobster. Bri: I am much better with the non-free Photoshop and better equipment, but I don't have that here. Basically what I did was take a second photo through clear glass and try to line it up in a second layer on top of the old photo. Then I used layer settings to try to eliminate the background image. This should cause the differences between the two images to stand out. However, the second image wasn't perfect (the tree branches are swaying in the breeze) and GIMP doesn't have interactive moving/resizing which makes it very difficult to do any matching. Still, it was a bit of an improvement. Also, I only had a couple of minutes to do it during a brief break in a very busy workday. I suppose Jesus in a bird smear wouldn't sell as well as Jesus in the grilled cheese sandwich if you put it on ebay? Hey there my friend. LTNS! Very good snap, very good manipulation.